This Discover Cooking with California Olive Oil Recipe Contest submission comes from Judith Richardson of We Olive Walnut Creek. 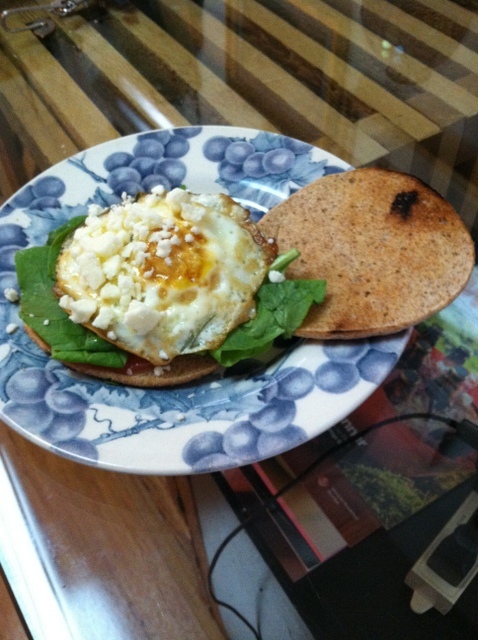 Her recipe is a tasty, filling, lo-cal breakfast sandwich that’s easy to make! 1. Preheat oven to 375. Split sandwich thins; brush cut sides with 2 tsp of the olive oil. Place on baking sheet; toast in oven about 5 minutes or until edges are light brown and crisp. 2. In a large skillet, heat remaining oil and rosemary over medium high heat. Break eggs one at a time into the skillet. Cook about one minute or until whites are set but yolks are still runny. Break yolks with a spatula, flip eggs and cook until done. Remove from heat. 3. Place bottom half of toasted sandwich thins on a plate. Divide spinach among sandwich thins. Top each with two of the tomato slices, egg, and 1 Tbsp of cheese. Sprinkle with salt and pepper. Top with remaining sandwich thin halves. This sounds delicious! I will make it tomorrow morning, after I go to We Olive to get the We Olive Garlic Oil. Thanks Judi!